There’s still a little early morning mist drifting around but its a nice morning which looks as though it will develop into an even nicer day. 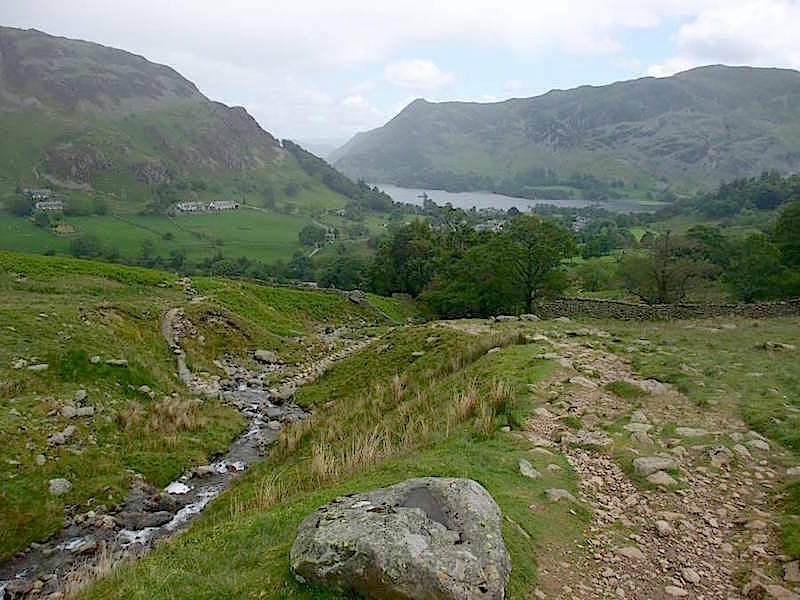 We started out from Glenridding, down there below the trees, and we’re walking up to Birkhouse Moor alongside Mires Beck. Its a pleasant route although its a bit uneven underfoot in the early stages as the photo shows. 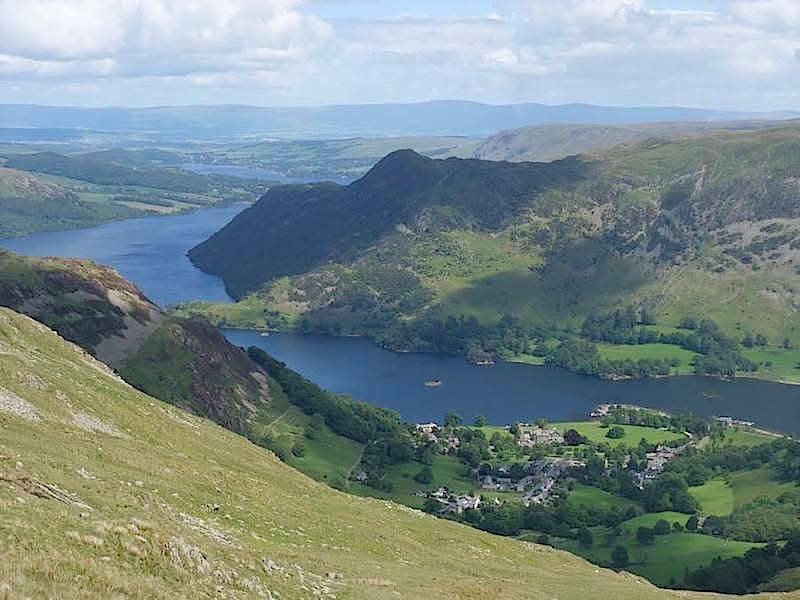 A great view from this point looking down to Glenridding, Ullswater and Place Fell. The cloud is thinning and the sun is beginning to make an appearance. 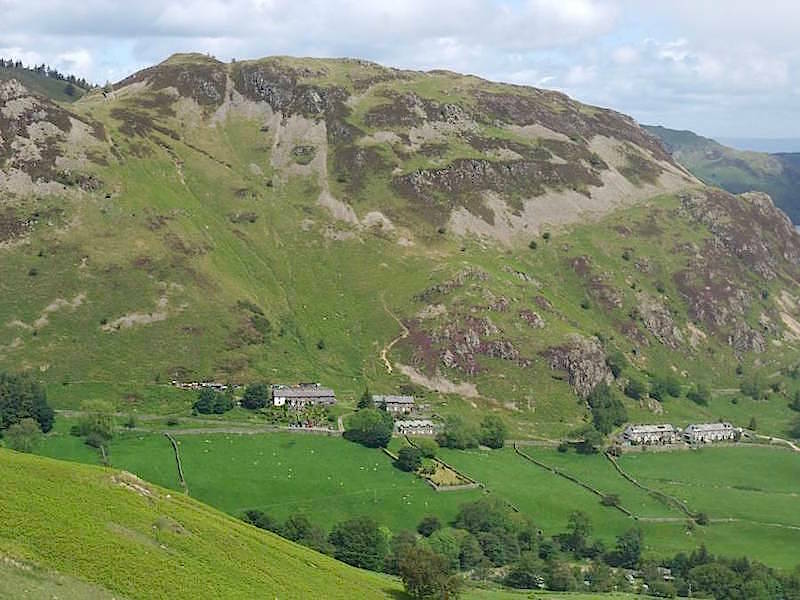 Over to the left of us is Glenridding Dodd. You can trace the route up to it by starting on the whitish coloured path which is curving round the outcrops just between the rows of cottages. It curves around to the top of the outcrop and then turns sharp left and rises along the steep diagonal up to the little col on the left of the shot. Once on the col the path takes a right turn and curves around for a short distance to the cairn on a rocky outcrop on the summit. 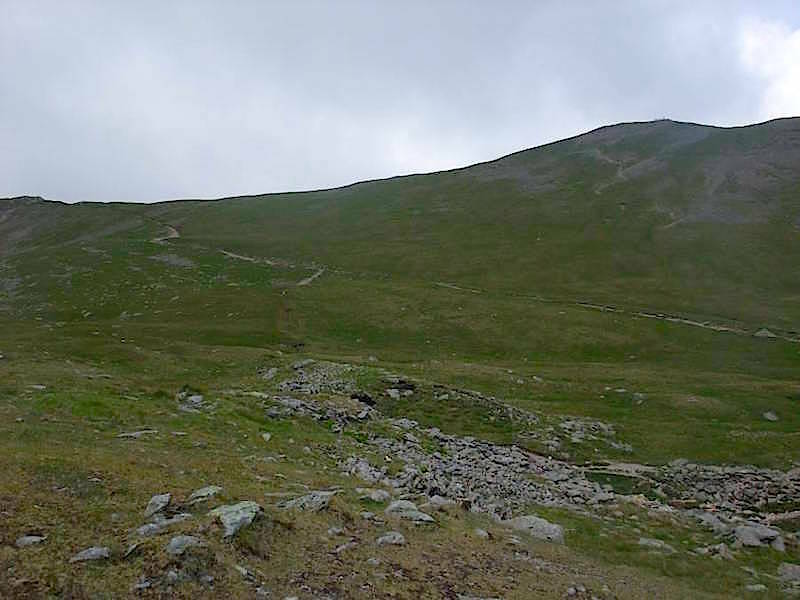 Its only a short walk but that diagonal section to the col is quite a steep one. 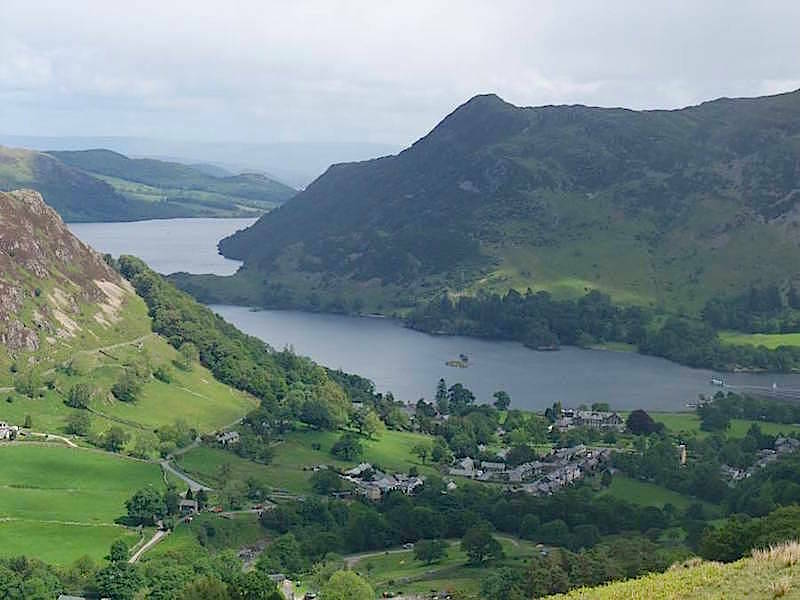 From an even higher vantage point you begin to get some idea of the size and shape of Ullswater. We’re also high enough now to have the Pennines on the distant horizon. 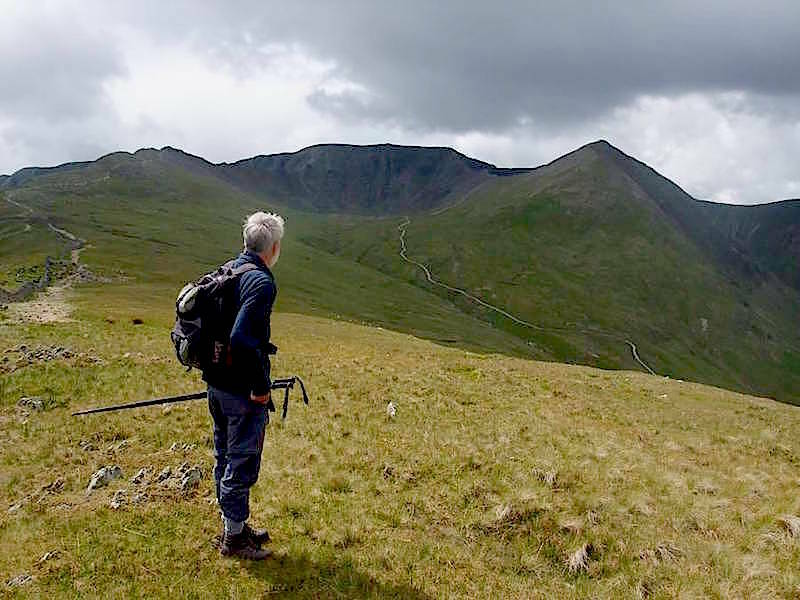 Having not been able to see very much ahead of us during the climb it was a bit startling to arrive on Birkhouse Moor in the sunshine and suddenly see ominous black clouds casting such deep shadows on Helvellyn and Catstycam. We carry on across Birkhouse Moor still in sunshine, but across from us Raise, with the zig-zag path, is also in deep shade. By the way, that path is a lot steeper than it looks from over here. The last time we walked up it there were a couple of young lads pushing their bikes up there and they were puffing and panting just as much as we were. The weather has changed, as you can see, and all the clothing which was in our packs is now on our backs. Ten minutes ago we were in blazing sunshine in June and now its so cold and windy that it feels like a raw day in January. 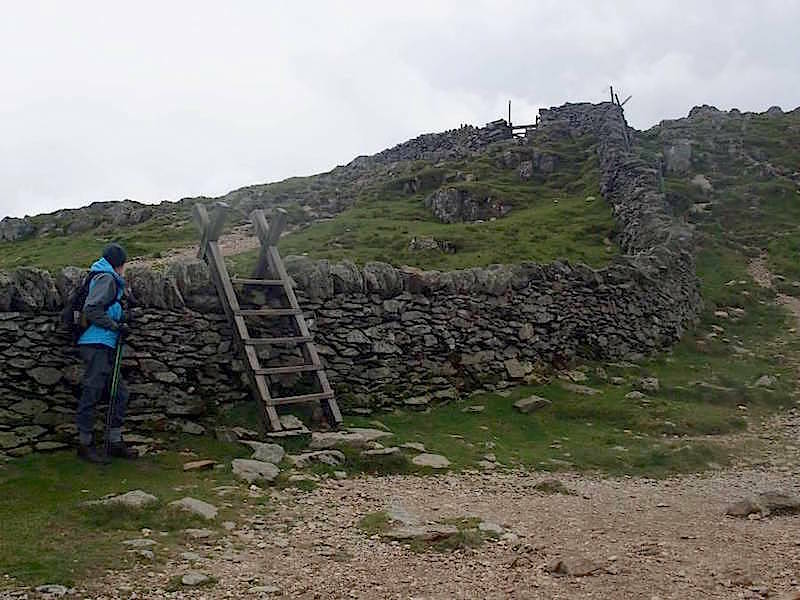 Aside from all of that, here we are at ‘The hole in the wall’, the starting point for the route across Striding Edge up to the summit of Helvellyn. 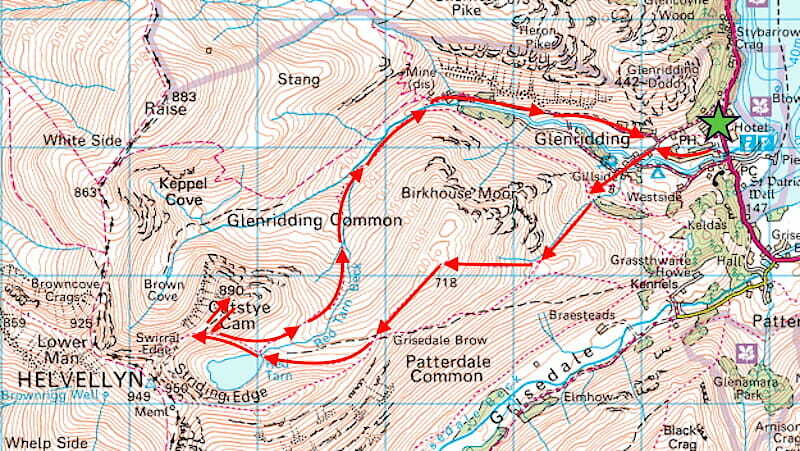 The wind is now howling across here as we make our way over to the Catstycam path. We debated whether to continue given the change in the weather but, as we were so close, we decided to carry on. Well, what can I say? The facial grimace and the jacket hood tells the story. 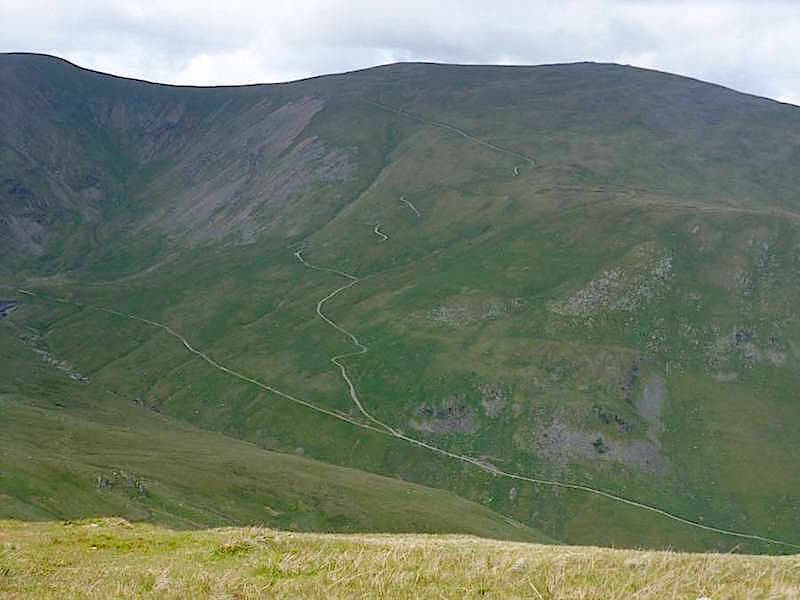 We’re on Catstycam with the summit cairn over on the left but no way can I, or dare I, stand up as I would have been blown straight over the edge like a piece of tumbleweed. The wind and hail were coming straight at us from the direction of Helvellyn, behind the camera, and the force of it was quite unbelievable. Behind me everything is greyed out by the hail, there’s not a trace left of the sunny day that we started out with, and the sunglasses are now providing protection against the hailstones. 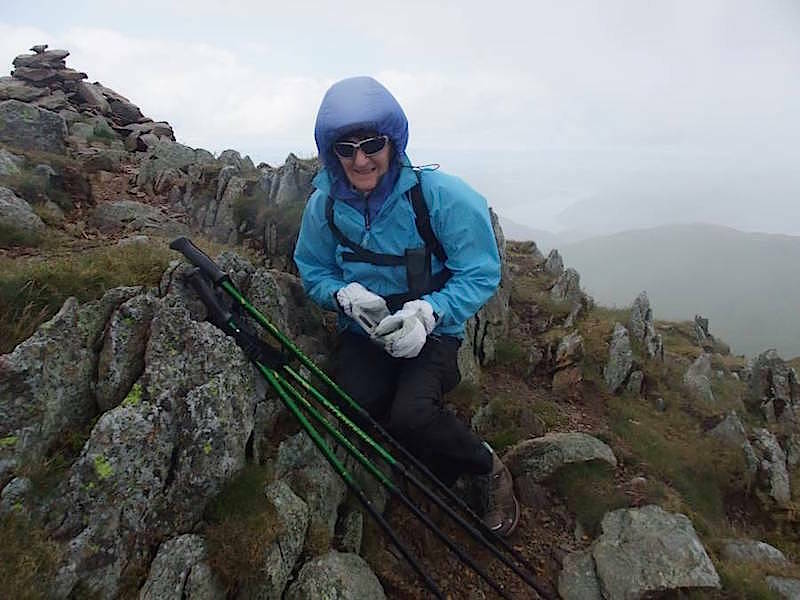 Needless to say the camera got packed away here, we made a careful descent off Catstycam, and hot-footed it back down to Glenridding where the hail was falling as rain. It just goes to show how quickly the weather can change, even in summer, and why you need to pack more than just your lunch in your rucksack.